10 Months on from vol 1, Illuminated Loops II has just been released to my Bandcamp subscribers. The Bandcamp subscription is still my main mechanism for releasing (and funding) the music I make – when you sign up, you now get 40 releases straight away. And you also get the next 12 months of music. All for your first year’s subscription. It’s a crazy deal, designed to invite people who are interested in what I’m doing now to get some context and discover where it has come from. 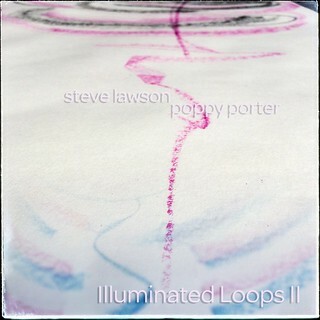 And so far that’s the only place to get the two Illuminated Loops recordings… There’ll be a LOT more recording from this project coming up later in the year… Sign up now at stevelawson.bandcamp.com/subscribe, to make sure you get it all as soon as it is released. This album, Illuminated Loops II, is the music from our Feb 25th 2018 show at Tower Of Song in Birmingham. As before, this recording is in some ways just a relic of the show itself – that it works so well as a standalone musical experience raises all kinds of questions about whether the fact that something is enjoyable affects what it actually is… if the music made no sense without the art happening at the same time, would it cease to be music, or at least worthwhile music? The art as a static entity is in the same precarious position – it’s beautiful and intriguing to look at, all the moreso if you know its origins, but the static version is just what’s leftover after the show. The unfolding, the interaction, the experience of before/during/after – the consequential nature of it all, of it coming into being – that’s ‘the work’, the show, the full experience. But, having said all that, don’t let it stop you enjoying the music! I’ve been saying for a while that making music in the context of Illuminated Loops results in work that is significantly more interesting to me than anything else that I do as a solo artist. Obviously because it’s not really solo – all of this is co-credited to Poppy and I because the music as it is wouldn’t exist without her. You can definitely hear my vocabulary in there, my musical accent, but the script is one that is developed between us as we go along. The fact that the music I make serves a dual purpose – the music as a journey through time, and the sound as trigger for Poppy’s synaethesia gives me a license to go to new places… The 2nd set here begins with a looped two note bass line played in on the Quneo – I’ve never used the Quneo for bass parts before, and hadn’t planned to this time! The whole soundtrack is littered with strange and surprising sounds that are meshed together via my long-developed ‘unfolding’ aesthetic… And, in listening back to it now as I write, I remember that when I mixed it, I left in all the crackles and pops and artifacts that were present in the audio on the gig, because they were part of what Poppy would’ve ‘seen’ and therefor drawn… In a pure ‘album recording’ setting, I’d have probably edited some or processed them in other ways, but here, they’re all there as part of the sonic canvas (in case you want to do your own synaesthetic representations and draw from the same source!) There is some video from this show around, so hopefully we’ll get that into a publicly releasable form soon, so you can see a little more of how it works! I love this project so much, and I hope you get some sense of what’s happening from this. And if you’re lucky, you’ll get to see it live soon – we really need to do more of it (weirdly, the thing that’s holding it up is me getting clearance for the research bit of my PhD from the ethics department at the Uni!) keep an eye out, and hopefully see you at a show soon.